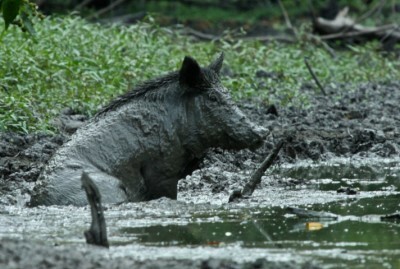 GRETNA, Louisiana — Feral hogs are the latest foe being taken on by the Jefferson Parish Sheriff’s Office. Hogs on the parish’s west bank are rooting up grass that keeps wind and rain from eroding levees and would hold the levees together if the river rose above their tops. The Southeast Louisiana Flood Protection Authority-West says damage averages $4,000 per incident. So it’s paying the sheriff’s office $25,000 for a year’s worth of pig-killing posses. Four deputies will go out to the levees twice a week to kill hogs, according to a news release. “We understand it’s virtually impossible to eradicate the problem completely. However, keeping their numbers down will have to be an ongoing part of levee maintenance going forward,” said levee board president Susan Maclay. At least 70 percent of the hogs in an area must be killed each year just to keep numbers steady, because the sows can produce two litters a year and become fertile at six months. Maclay said the authority reviewed choices for six months before signing the agreement Thursday with the sheriff’s office. Former Sheriff Harry Lee began the nutria-control missions after local residents objected to poisoning nutria.